Mrs Dragon's Den: Day 147/365--Birdies! Yesterday was our housewarming party, which turned out quite lovely (more on that later). Apparently, in the south, when you have a housewarming party people are very serious about bringing housewarming gifts. I had always thought that they were optional, trending towards small little somethings. My first hint should have been that a friend asked me if we had a registry. (Uh, a what?) Everyone who came, came bearing gifts. Which was totally sweet, even if completely unexpected. 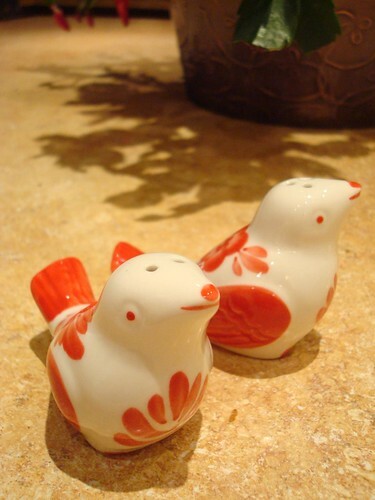 These adorable little birdies are salt and pepper shakers. The brown object in the background is the pressed metal pot for a Christmas cactus, which is also totally lovely. Our house is certainly nice and warm with the out pouring of happiness and good cheer and the hubby and I were happy to play tour guide and show off our handiwork. That's right, honey, we do housewarming's right in the south! I registered with myregistry.com for my housewarming party last year and only one person brought a gift that wasn't on the registry (it was wine though so I enjoyed it anyway!). I think it's tacky to show up to any party without at least a small hostess gift, so you might as well let people know your taste!